When we have the chance, we like to post tips and tricks to help you get more out of your VMware Fusion. Today, we’re discussing an issue, where when using VMware Fusion to run Windows on Mac, in Unity mode, the icons for Windows applications show up blurry. A helpful anonymous user already posted a solution for this on macosxhints.com, but we wanted to highlight it here and provide a bit more background. Explanation: Why are those icons blurry? Here is a close-up of the application switcher. Do you notice how the Windows Media Player, Internet Explorer and Windows Explorer icons are less sharp than the Finder and Firefox icons? The workaround for this issue is fairly simple: replace the old small icons with larger ones. One small hitch to this is that it’s fairly difficult to obtain larger versions of the same exact icons. However, fortunately there are a number of free alternative icons on the web, some of which look arguably even better than the originals. Below we use a few icons made by Benjigarner and TpdkDesign.net, available on iconarchive.com. First you will need to find replacement icons. As we mentioned above, there are a number of well-designed and free icons on the web. Just do a Google search for "free icons" and you’ll be sure to stumble upon icon-focused websites. A number of designers on these websites design icon sets so that the icons for multiple applications will have the same look and feel. When looking for replacement icons, you will want to download versions that are at least 128×128. These will be located inside the .vmwarevm file of the relevant virtual machine. Typically, the .vmwarevm file is located in: ~/Documents/Virtual Machines. For those with a Bootcamp partition, you can find the .vmwarevm file in: ~/Library/Application Support/VMWare Fusion/Virtual Machines/Boot Camp/Boot Camp partition.vmwarevm. Ctrl-click (right-click) this file and select "Show Package Contents." Go to the Applications folder and you should see a list of Windows applications. Select the application which icon you would like to replace and choose Get Info (Command-i or File » Get Info). The window that pops up should have an icon in the top left; this is the icon that you will replace. Step 3. Replace the Icon! Leaving the "Get Info" window up, open up your replacement icon in Preview. Go to Edit » Copy to copy the image to the clipboard. Go to the "Get Info" window and click once on the top left icon. (You will see a subtle shadow around it indicating that it has been selected.) Finally, press Command-V to paste the image. The "Get Info" window should update to show the new icon. Repeat steps 1-3 for each application you would like to change. If you change your mind and would like to revert to the old icons, just go to Get Info again, select the icon and press Delete. When you are done, you should now be able to interact with a new sharp set of icons. PS. We would love to hear about the icon packages and icon websites that you like. Feel free to post in the comments. This entry was posted in Uncategorized on June 24, 2008 by Jonathan Chu. Interesting. 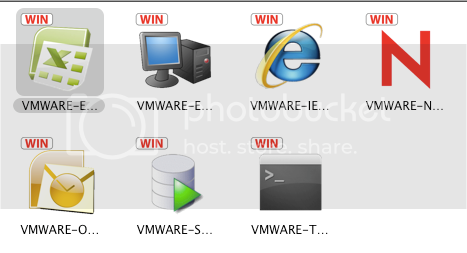 This blog ( http://blog.heatery.com/2008/06/replace-dock-icon-created-by-vmware.html ) says that you have to change the permission on the docker.icns file to keep Fusion from replacing the new icon with the old blurry one when you restart the app. Is that actually not necessary? Because the method outlined here is a lot quicker/easier. Me, I sorta like the blurry Windows icons. It creates a nice visual distinction between my joy that is OS X and my misery that is Windows. any chance you can/will integrate this option into Fusion, like as part of the VMWare Tools? Barron, I didn’t have to deal with changing the permissions and the new icons were still there after restarting the app. I suspect that this process is slightly different than the link you posted, since I’m letting OS X replace my icon and am not replacing any files. I’m currently using a beta build, so let me double-check that this is also the case using the VMware Fusion 1.x build. Fyi, there’s no need to hassle with permissions in 1.x builds either. Jonathan, thanks for the confirmation. This method is a lot easier than the one I linked to. I’d comment about which icons I like the best, but I can hardly find any good ones to go with Windows apps. This is so great, thanks. My images are here… I added a little “WIN” tag on each one to make it more pronounced that they are part of VMWARE and not my Mac normal apps. I cannot find the .vmwarevm file anywhere in OS X. I’m running v1.1.3. Spotlight searches for .vmware, Virtual, etc. return nothing. RyanS, try doing a Spotlight search for the name of the virtual machine. (i.e. the text that shows up in the Virtual Machine Library like “Windows XP Professional”). The vmwarevm file will be a large file (probably > 1gb). The vmwarevm extension might be hidden in the filename, but you can double-check you’ve got the right file, by doing a Get Info on the file and looking in the “Name & Extension” section. NOTE: I’m using Fusion as a back door into a Boot Camp partition. Also, I have NOT yet tried to replace icons but will try it tonight. The site stripped out portions of my earlier post that looked like code. Sorry for the extra post. What about Boot camp partitions? Should we change the icons within the Windows partition itself? Will Fusion pickup the new higher resolution Icon? What about the programs I use that aren’t listed in the Applications folder? The only things I have are Firefox, Windows Explorer, Avast, and Windows update. I was looking to change the icon for Slysoft. @Cary Brown, I just installed a bootcamp partition before and am looking into it. @Jake, what version of VMware Fusion are you running? All of the large Widows icons are severely corrupted. The shape is right, but the icons are just jumbles of colors. Any fix for this? How can I make fusion rebuild the icons. @Cary Brown, apologies for the lengthy delay. Bootcamp partitions create a vmwarevm file in another location: ~/Library/Application Support/VMWare Fusion/Virtual Machines/Boot Camp/Boot Camp partition.vmwarevm You’ll be able to follow the same steps as above on the applications folder inside that file. Thanks for the tips. Tried doing what you recommended, but when the dockers are rebuilt, they are corrupt! Aargh! @Steve, perhaps the icons have actually been corrupted in Windows. Can you try the instructions in the following: http://www.pcmag.com/article2/0,2817,1206406,00.asp (I’m assuming you have XP) and then rebuild the docker icons again? Thanks Jonathan, but it still didn’t work. I cleaned Windows icon cache, deleted all dockers, they are still corrupt when rebuilt. See image at Notice that the mini icon is not corrupt. Yes, VMWare Fusion should use the large Windows Vista icons if running Vista as the virtual OS. Do you know if this will be the case for v2.0? Thank you so much for this! It is so easy and now my dock looks even better! I agree that the enlarged icons are annoying. My problem is that I keep switching them and fusion creates a new pathway with the original icon. For example, I am at “Notepad – Windows XP 8” How can I lock the icons in place to prevent Fusion from creating additional paths again and again? Anyone? Please email me at Christopher.Topp@gmail.com if you have a solution!! Not sure why, but this worked for me for 2 of the Office apps, but not the other 2. I was able to change outlook and Excel, but not work and powerpoint. I even tried the alternate method listed above. Very frustrating. Well, not sure why, but I managed to get it solved. The way I did it was not to go to the directory within the VM itself, but rather, right-click on the fuzzy icon in the dock and select Show in Finder. This takes you to the exact file that is being used (not always the one found previously) and then you can follow the rest of the instructions. Going directly to “documents” shortcut in left finder pane will not take you to quite the same place. I’m running latest version of Leopard 10.5.6 MacBookPro. Also, I’ve just accidentally noticed – a much quicker way to get to the correct folder!! Have VM Fusion and windows running, run your windows applications whilst in unity and then from the mac os x dock hold down the cmd key and click on the blurry icon. This should load the application location into the finder window and even highlight the application for you! Easy peasy!